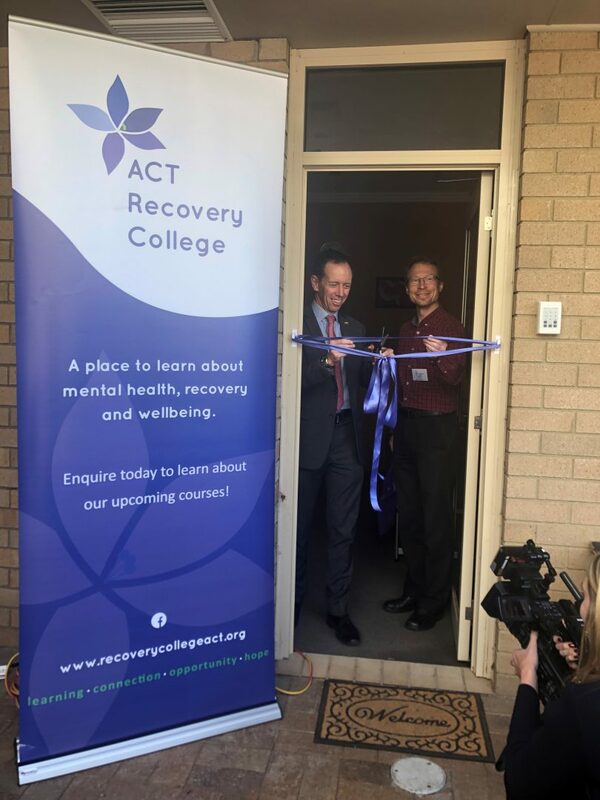 ACT Mental Health Minister Shane Rattenbury with Simon Viereck from the Mental Health Community Coalition ACT at the opening of the ACT Recovery College. Photo: Supplied. Canberrans with mental illness will be offered free courses on mental health, recovery and life skills under a new trial which will run for two years. The courses will be run by the new ACT Recovery College which opened on Wednesday (April 10) and aims to support people with mental illness, their families and carers in their journey to recovery. ACT Mental Health Minister Shane Rattenbury said at least 65 per cent of Canberrans with mental illness do not seek treatment until it becomes serious. He said the ACT Government has been listening to Canberrans who have been saying they need more information and support for self-directed care and self-management. The Government will be investing almost $900,000 to roll out the trial. “The Recovery College is a person-centred initiative which will provide a doorway for people with a lived experience to enter mainstream education, increase their employment opportunities and lead a more integrated and meaningful life,” said Mr Rattenbury. Mr Rattenbury said that students who join the ACT Recovery College will have an opportunity to discuss their goals and develop an individual plan with an educator to help meet those goals. “We acknowledge that everyone’s road to recovery is unique, which is why the ACT Recovery College will not only cater to people’s individual needs but also the needs of their families and carers,” he said. Mr Rattenbury said that recovery colleges have been successfully established internationally and are a key feature of contemporary, recovery-oriented mental health services.